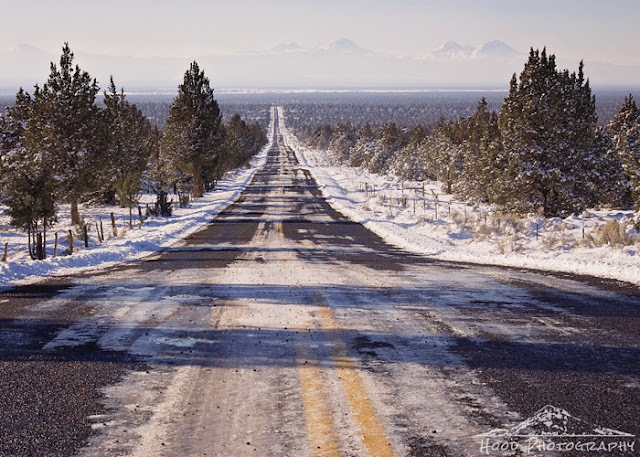 Looking west from a high peak on Reservoir Road outside of Prineville Oregon, you can make out the tops of the Three Sisters - Faith, Hope and Charity - through the wintery haze. Outstanding. Means even more since I have been there when there was no snow. Fun to see that view now. What a pretty view, great shot! Enjoy your week! Oh yes, I can just barely see the Twin Sisters in the far off distance. Thank you for entering and participating!! slippery! now you have flooding in Oregon. Sensational! Thanks for joining us on this week's Maple Hill Hop! We LOVE your outdoor shots! What a great shot, what a great road! That's an awesome scene. I love it!! Oh wow. Such a stunning and icy landscape, and the photo is amazing as well! Thank you for sharing your image with "Through My Lens"! What a view and so wintery.